Nothing this year. Also no work has started on a manual. A very little has been added since those, and the ladder centering has a show-stopping bug. There are a lot of releases about to hit the AtariAge store. Still a good idea for a DIY project. I did just get my first xonox recently. It came along with other gear I wanted. Let's see... DK Arcade and DK VCS are both 32kb but they use different PCBs, correct? Yes. DK Arcade is DPC+ bank switching from batari Basic; D.K. VCS is 32K plus SARA RAM bank switching. As I understand, Melody can run it all (which is Harmony or Harmony Encore with less parts), and then there are Melody light boards with less parts for games that wouldn't use all its resources, and then even Melody light light for probably just the simplest 8K - 16 or 32K. I don't even know how my 4K FLAPPY is made, but if I had to guess I would say an EEPROM. Both are excellent ports, despite playing differently. I'd give VCS the edge on audio, graphics, arcade on accuracy. Tonight, May 11, 2018, Twitch channel ZeroPageHomebrew will be playing my newest build of DK Arcade 2600 on that stream at 7PM PT/10PM ET. If you miss the live stream, it will be posted on YouTube in a few days. I can't wait to see if the gameplay outweighs the difficulty and the few bugs like when climbing a ladder and the centering fails which leads to an unfair death. Also on the Spring level it is very easy to fall off the small platforms, and I've seen lots of people die trying to climb the last ladder with the "sproing" killing The Carpenter when they all follow the same path, unlike the Arcade which puts out the sproings at 3 different horizontal positions. Even the second time through when there are 2 sproings they also follow the same path but you need to get to the safe spot to the left of the last ladder to make it up. "Byte Knight" did an amazing job of coding the game logic. He has an Arcade cabinet, and kept wanting to make things harder. It is actually easier than the arcade because of things like being able to change directions mid-jump. We we really pushed the batari Basic DPC+ kernel because to reduce flicker at the top of level 1, 8 more visible scanlines were added. The most CPU intense part is if you get the first level 1 hammer. The CPU is checking left/right, collisions with hammer to barrel, the hammer tune playing, the new barrels being thrown out, checking where the floor is, and more. That's where it over-cycled, so a tweak to overscan time fixed that. That makes the game run with 270 scan lines (normal is 262), and it runs at 58 FPS (normal is 60). Even way off the recommended 262/60fps, I haven't found a console or display that loses sync and blanks out. We both learned new things. The stream had problems with the flicker. This game and Star Castle Arcade both flicker at 58fps. The YouTube and Twitch repost have perfect 60fps capture. I knew about the ladder centering failure sometimes, and I can't find a fix. I tried a wider range check and a lesser range check. Sometimes the routine just returns a value that is not under the ladder, and if you climb to a platform you should be able to stand on, you will fall to your death. Sometimes it sees the broken ladders as okay when jumping and you can climb them or glitch to a death. I learned that the orange level 2 has a misplaced pixel in the lower left. Although maybe I commented that out to add something. Turning on or off of playfield pixels in "batari Basic" uses a lot of cycles and ROM! That on & off playfield pixels is how the Elevator platforms are done. I was sure that wouldn't work (as I had used sprites), but Byte Knight's code worked better. Level 1 girders and Level 3 elevators both come very close to doing more than the CPU can process. Due to the CPU drawing the display, when a game uses too many CPU cycles, the display will jitter or roll. See the top of the first post in this thread for binary file. I've decided to share "DK Arcade 2600", and post the Release Candidate. This has sound, item, color differences, along with a fixed Kernel that should eliminate any "flashing ghost playfield pixels" that appear when nearly cycle maximum and that some machines were displaying. The "latest batari Basic" version from RevEng's thread has this fixed kernel. Reply in this thread any comments and suggestions - they are all considered, no matter good or bad, or not possible to include! Thank you. It is also decided by me, the author, that any "Release" will be through this "batari Basic Forum Thread". 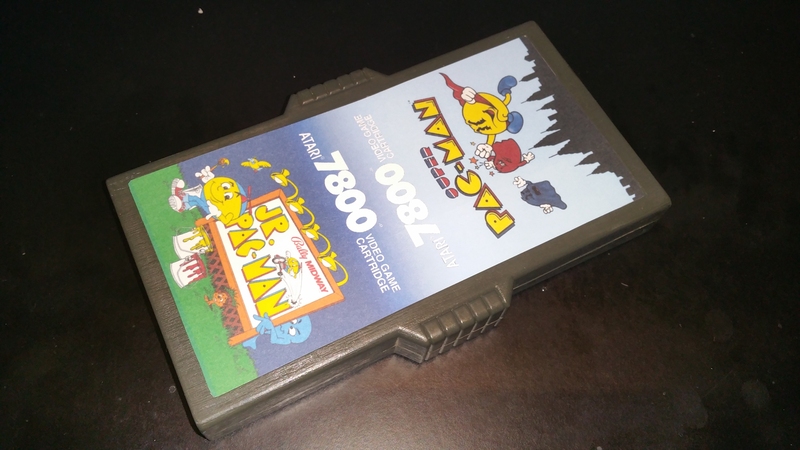 If you expressed desire for a real cartridge in this thread, no need to post again. You will be contacted when I have finished cartridges available later in 2019 or next year 2020. Payment will only be taken when finish cartridges are available - made with AtariAge hardware. This was my first designed game, both because I liked the game, I liked the challenge, and I wanted to show that very good games can be made with the "batari Basic" DPC+ kernel. This is an awesome update iesposta!!!! Count me in for a cart! Thanks! Really fantastic job on this game! It looks great! This version seems to be generating too many scanlines, though (271 instead of the expected 262). Well, this is pretty incredible . . .
Added 8 visible scan lines to separate The Lady at the top from the barrels to cut down on the top flicker. Also to make it taller because the original was "portrait" orientation. Flicker is still heavy. This causes overscan to change, and overscan was also hacked to not over cycle on level 1 during Hammer Time - when the most routines are running at the same time such as music, barrels, scoring, movement, collision, animations, etc. If I remember correctly, the barrels are animated, moved, checked for collisions, over 4 frames - Byte Knight did the game logic code. For those bB programmers going over cycle, splitting tasks over 2 or 4 frames may be the answer. It is designed for CRT display, but I've played it on many different displays without problem, just strange flicker because of the 58 fields per second. Some builds were coming out 270, and some 271. It is good as long as the "How High Title Screen" scan line count matches the game scan line count. It is very similar to Star Castle Arcade in terms of scan lines and less than 60 fps. For those interested, another hack was removal of the vertical scroll routines which returned a bit more than 200 bites back to bank1 for program use. Still irked I had to cut the "stomp the girders" intro as I had programmed and finished that. It was taking around 800 bytes. Count me in for a physical cart!